LMC is committed to delivering peanut processing systems and equipment to help peanut processors achieve maximum capacity and efficiency for their dollar. Originating from the rural peanut farms of South Georgia, LMC has become the world leader in the peanut shellers and equipment for the peanut shelling process. LMC equipment is responsible for shelling 90 percent of the commercial peanut market. Our machines are designed specifically to maximize processing speed along with separation effectiveness. What makes LMC unique is the staff of peanut specialists that can design, build, deliver, and install an entire peanut processing operation. From cleaning to separating, back to cleaning and shelling, LMC equipment can take you through the entire process customized to your specifications. Also, by removing the lower-grade peanut prior to shelling, your end-produce will be of the best quality, yielding you the ultimate monetary profit. Used to shell peanuts with high efficiency, high capacity and minimum split creation. Used to separate dry, flowable products, like peanuts, by specific size. The LMC Destoner has a reputation for being the most reliable, user-friendly, and efficient destoner available. LMC Aspirators are designed for product separation by density and aerodynamic profile. Multiple configurations available. LMC Produces the best Whole Nut and Split Nut Blanchers on the market. Used to gently convey products. Used to separate lights from heavies based on density. LMC Elevators are typical of the innovative nature valued by LMC. Used to remove twigs, stones, and dirt from peanuts. Capable of receiving large volumes of product while also providing accurate cleaning capability. 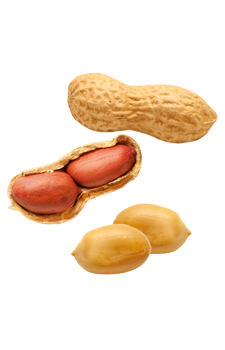 We cater to processors of peanuts, groundnuts and various other nuts. With this large range of peanut customers, we have made contact points all across the world to include South America, Australia, the Western United States including California, the Middle East and Europe. LMC recognizes that peanut processing and separation equipment is a long-term investment. We have provided after-sale support and service to our customers for over 70 years. Our teams will stand by your peanut and groundnut processing equipment for as long as you own it. We invite you to contact us so we can demonstrate what sets LMC above the rest. As a leader in producing World Class Machinery, LMC offers solutions tailored to not only your specific industry, but also to your specific company. From gravity separation machines and destoners to vibratory conveyors, LMC produces custom-built industrial separation equipment for your unique processing requirements. Rebuilt LMC Model 8448 Farmer’s Stock Peanut Cleaner For Sale! Copyright © 2015 Lewis M. Carter Manufacturing, LLC | Website by: Strategy6.